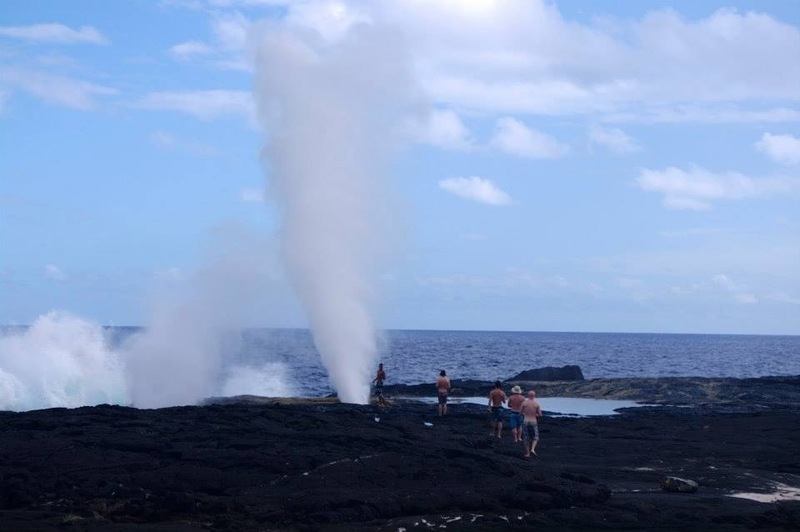 There are blowholes, and then there are the Alofaaga blowholes. 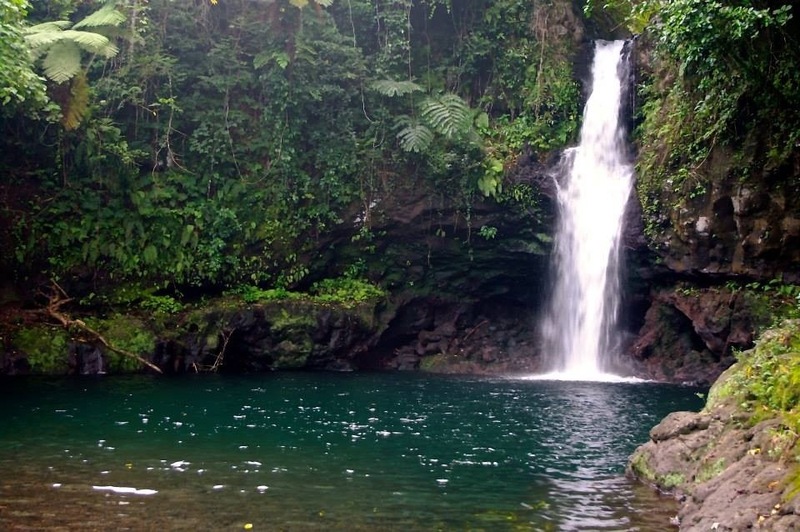 Located on the South west coast of Savai’i island, these natural treasures can provide you with hours of fun! They aren’t just a small spurt of water coming through a hole in the rocks. These things pump the ocean swell through the side of a cliff, into a cavity and out of a hole big enough for a few of us to fall into. The jet of water is so powerful it shoots hundreds of feet into the air. The sheer power of these blowholes is absolutely unbelievable. 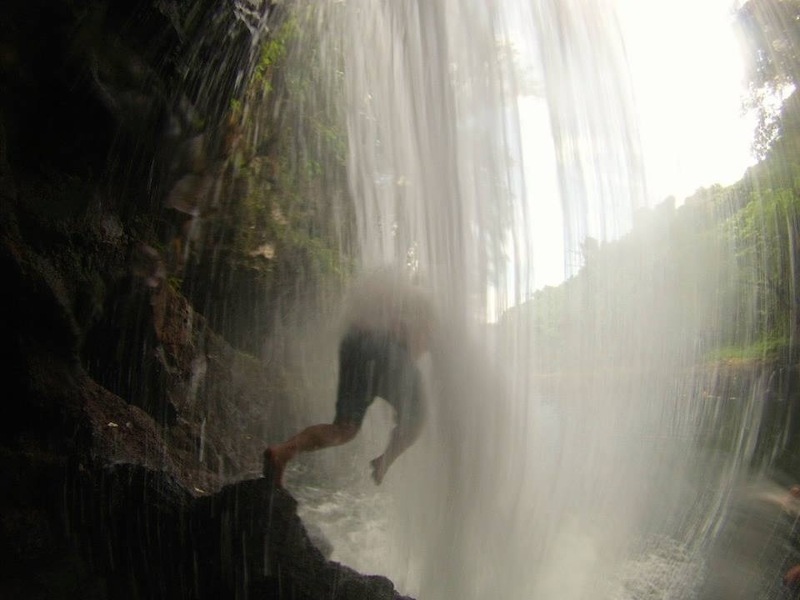 A waterproof camera is a must-bring item to this activity. 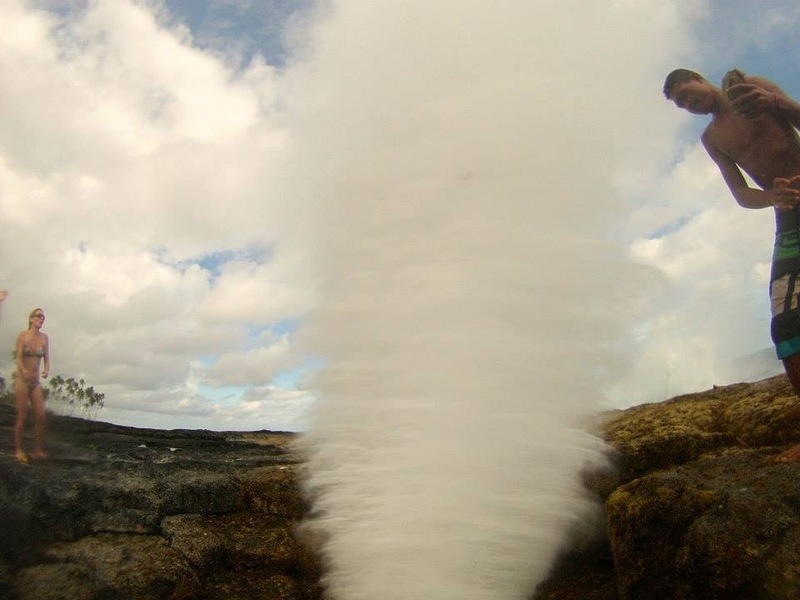 If anyone can figure out a way of having a gopro camera shot into the air with one of the blowholes, and retrieving the footage, then they would be my hero for life. The experience is only really worth it if you bring a whole heap of old coconut husks with you. Now here’s a tip. If a guy offers to come and do the coconut throwing for you for 40 tala, don’t do it. There is nothing wrong with bringing your own. You have to pay 5 tala each to enter the village anyway. 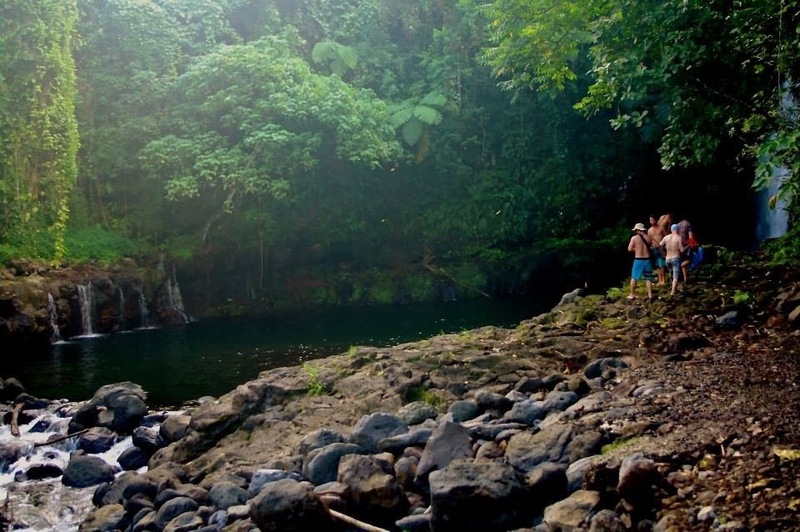 Once you arrive at the blowholes, it is highly recommended that you strip down to swimwear. You WILL get wet. Throwing coconuts, coconut husks and old weaved baskets into the blowhole had us giggling like school girls (I was the only actual girl there, but it sounded like there were 10 of us) and wanting to stay for the rest of the day. We almost forgot that we had other places to go and see. Our fabulous blowhole experience did almost end with a casualty. Turns out that shooting coconuts hundreds of meters into the air can be quite dangerous. This video shows our friend Riki almost get wiped out. The coconut missed him by about 30 centimeters. Needless to say, we could not stop laughing about this for the rest of the holiday. 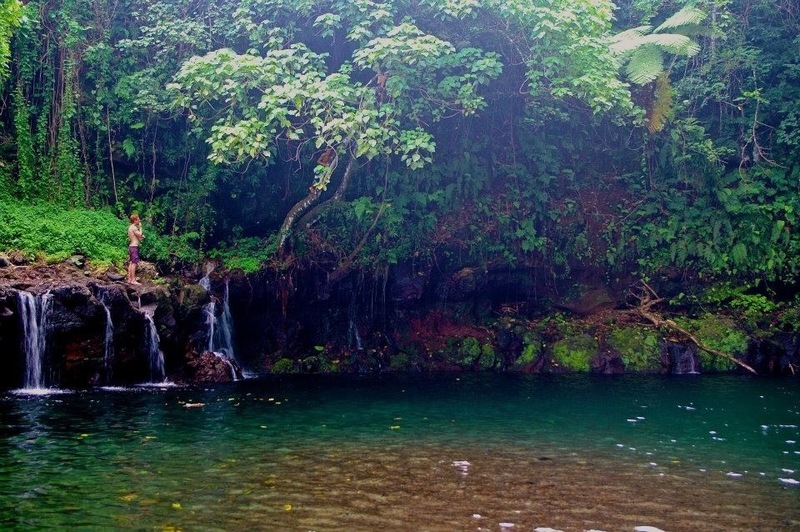 This place is everything you could ever ask for in a waterfall and swimming hole. Wonderfully fresh water, a deep pool in which you can jump from the cliff on the side, and many rocky areas where you can lounge around. There is also a tree you can use to swing from into the water. … Really all it does is slam you downwards. More giggles. OK, so there was a bit of confusion after we completed this activity. 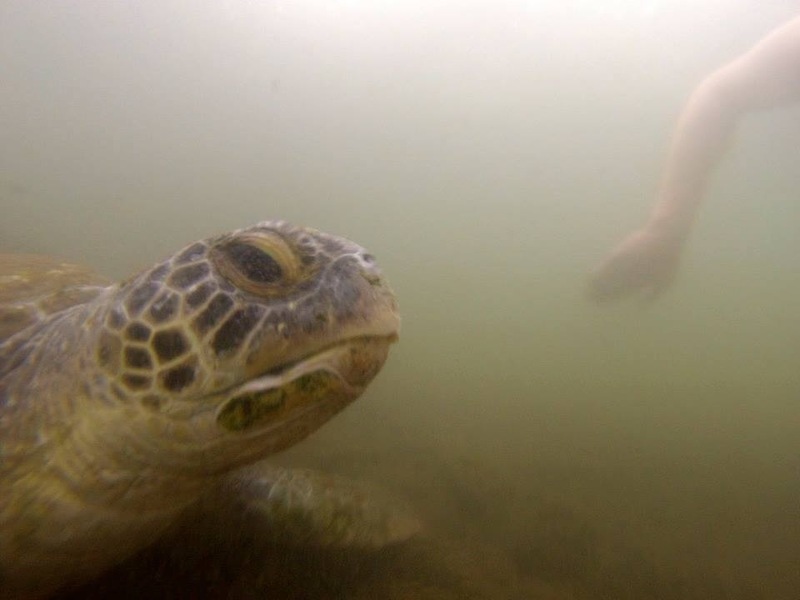 Satoalepai village raises turtles in a half fresh half salt water pool besides some wetlands. Apparently they release them once they have grown up. Now, we were expecting beautifully clear water and to be able to see the turtles from outside the water. When we arrived there was no one around except for a small child who was sleeping on the seats near the pool. He got a big fright when we walked over. He did not speak any English. The sign outside said “swimming turtles” not “swim with turtles.” The water was an icky dirty brown, and there was a smell of sewerage.. That didn’t stop us. One of the boys belly flopped in (because there was no where to really climb down by ladder or anything). The young boy starred wide-eyed and quickly ran away. 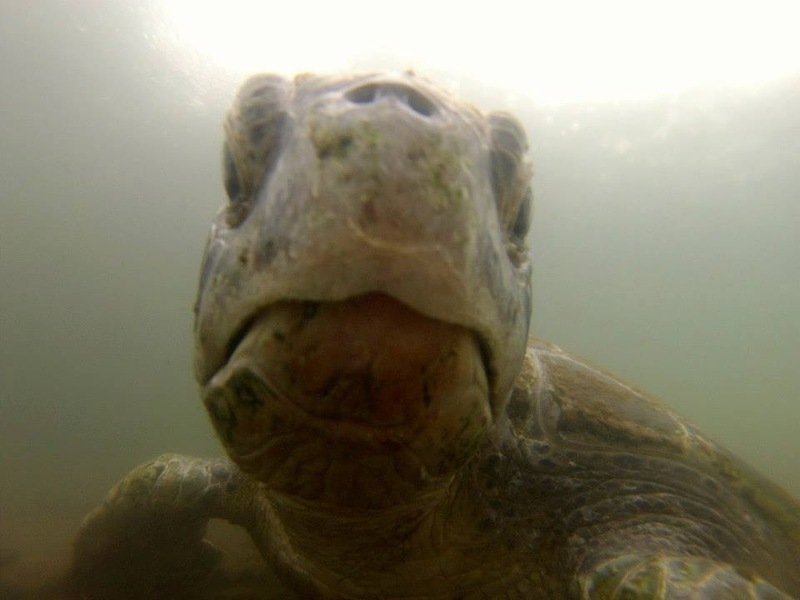 Maybe we weren’t supposed to swim with the turtles??? Anyway, we all got in and swam around searching. It did not take long to come across some inquisitive turtles. With 6 of us splashing around, they quickly got their daily exercise. Given their size, I’m questioning whether they really do get released as adults. However, we did notice the gate at the end was half open, so they could get out. That made me feel a little bit better. We had to find a villager to pay our 5 tala each. Then as we were leaving, another bus of people arrived. Fully clothed, with no intention of getting into the pool. We left quickly, wondering whether we were actually supposed to have swum…. And when our ear infections would arrived. I’m happy to report that despite the sewerage water, none of us got sick. We were also later reassured that it is fine to swim and even feed the turtles papaya! This massive lava tube has a few different legends, which revolve around dwarfs inhabiting the cave. No one knows the true story because the village changes what they tell their visitors every time they do a tour. There are about seven different versions. It’s pretty amazing going through this dark and humid tube, wondering if a rush of water is going to run down and sweep you all away (for those who watch too many movies). It had been raining quite heavily the day we went. Because of the rain, we were only taken to the right of the cave, where it reaches an end. Apparently to the left, no one has ever found the end (and that’s where the dwarfs are living). There are also small pools in which you can swim around. It was too wet for us to go there. Uncle Bills can be found just near the ferry terminal. This triple fried KFC seems to be a favourite amongst the Samoans. I recommend buying a family pack between two people. It will blow you away to a fat fried coma. 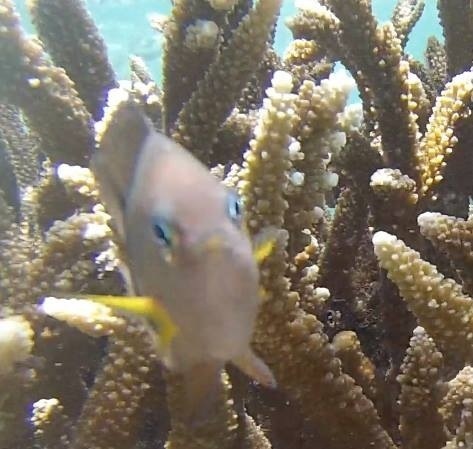 It’s a tropical island, so of course snorkeling is on the list (unless you spearfish and then you do that). This is something that can be done all around the island. There are many amazing reefs. The island is practically surrounded by it. The fish are a whole lot of fun, and appear to be quiet feisty at times. No words are really needed. 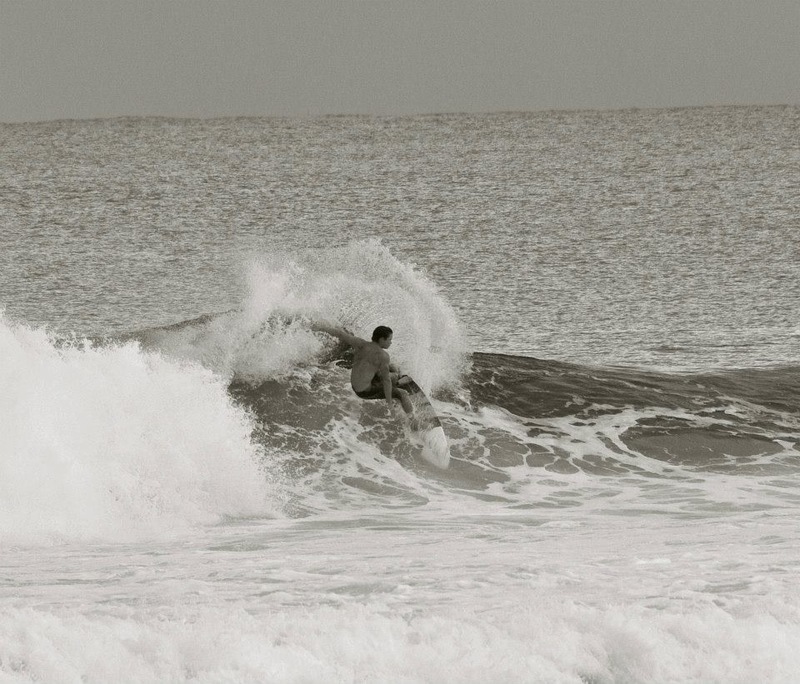 However, I will say that you need to be at least an intermediate surfer to be able to enjoy the surf in Samoa. The reefs are shallow, and there are no sand bottoms. 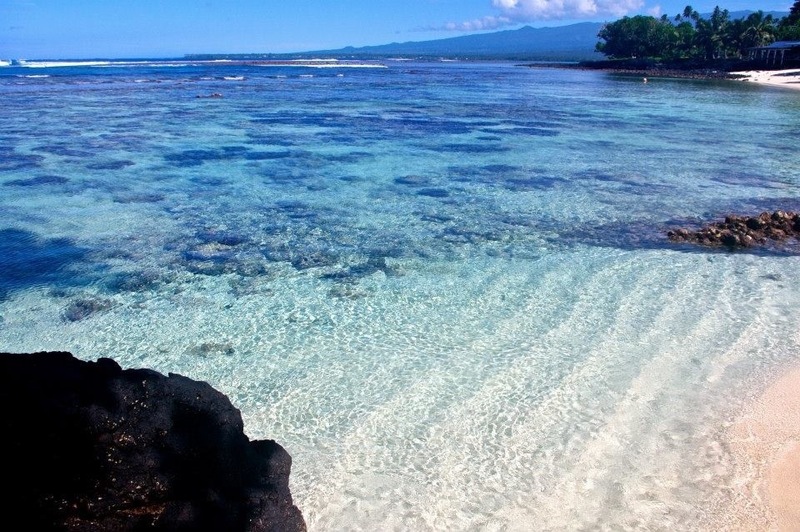 There are so many more amazing sights on Savai’i island that we did not see. To be honest, Samoa is so relaxing it was quite difficult to get motivated to go away from the beautiful cove where we were staying. It had everything we wanted/needed. However, I’m sure we have missed some fabulous sights! 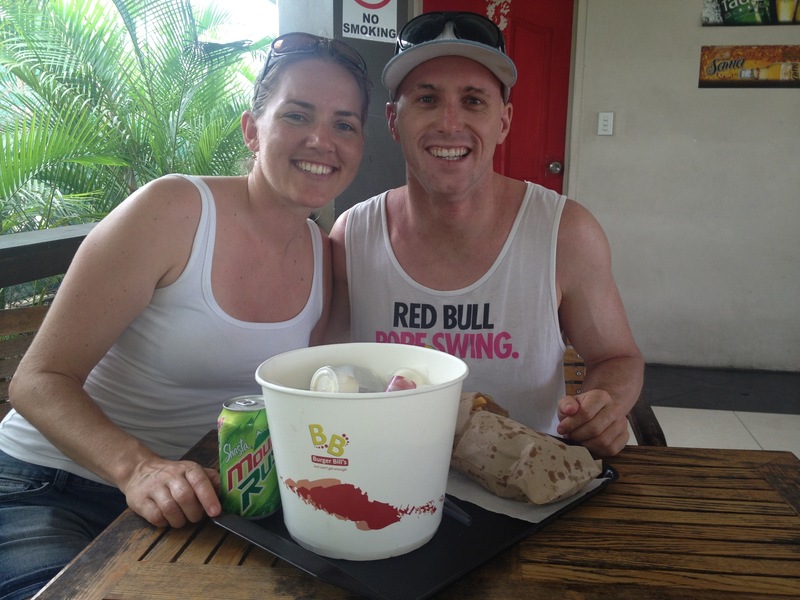 We did, at times, get off our bums and explored the areas near our surf camp. At low tide we were able to explore the caves and natural springs that oozed out of the side of the island. Everything is just so beautiful on Savai’i island that I’m sure you could just keep on exploring and finding many natural beauties. There is only one road around the whole island. You cannot get lost. 90% of the land is village owned, so where ever you go you generally pay 5 tala to visit. Be respectful to the Samoan culture. It is inappropriate to walk around in bikinis. When visiting villages that have water activities, it is fine to strip down for the activity, but important to cover up before going to the car.